Barker's Type 2 Ketosis Prone Diabetes / Atypical Diabetes T1b/ Flatbush Diabetes: Thinking about: Western technology, food and the health of people of color and world food production and trade. Thinking about: Western technology, food and the health of people of color and world food production and trade. I've added, what I think, is an important addition to this post. If you've read this already just skip to the bottom. Guess whose back? Me! I've finished my latest assignment so it's back to KPD or abrupt type 2 diabetes; however you wish to look at it. I was working down in Southwest Detroit (One of the few multicultural areas there.) and I was looking at many of the people walking around and many of them were heavy. The thing about this area is that it isn't a "food desert" there are plenty of stores with many types of produce. This is also a working class area so most people do work that requires a certain amount of physical effort. Yet the story remains the same, way too much weight and with all the problems that this portends. One of the things that helped to keep this in mind was looking at the stats on this blog while I was away. This blog in particular seemed to be getting a lot of those hits. I tried to address this issue further while I was away with this blog. Now I want to go back again and try to put this all a little more together. In the last thirty years diabetes appears to be surging both in the US and around the world and it seems to affect people of color disproportionately. You should look at this graph very carefully. Something happened after 1990. One of them is probably a statistical fluke having to do with the change in what is considered diabetic or the fact that the US baby boomer population is entering its mature years but you would expect for that to flatten out eventually. It hasn't. Here's another fact to consider. Diabetes is a chronic disease that develops overtime. How long this period of time is varies. Even in the case of Abrupt onset T2, there appears to be a long lag before our type of diabetes becomes full blown. You can view that here. My point is that viewing the take off point of diabetes isn't enough. We have to look at the preceding years and what might have occurred in them, if we wish to see some turning point. The time frame we're looking at is about 30 to 40 years and frankly there are plenty of changes that have occurred in this time that could be correlated with this sudden take off in diabetes. This is diabetes, however, and the dog that hunts best here, at least for me, is diet. I've talked about the contamination of traditional foods before. Here. You could look at this post as an expansion of that post. My point was that due to economics the constituents of foods around the world are being replaced with cheaper products that I think are problematic. First up: wheat. Wheat has been around for years. It was first domesticated around the Fertile Crescent and this wheat is Emmer. Later on with get Eichorn wheat and a host of other varieties. Wheat has been bred and bred through out the years for all types of qualities. It has become one of the central characters in the diseases of civilization. Take a normal healthy society of humans and introduce them to flour and problems tend to arise. Denise Minger on her blog statistically demonstrates a strong correlation between wheat and cardiovascular disease. What should be even more worrying is that 99% of all wheat is of one kind, the dwarf wheat variety. Many people have pointed to this variety as having toxic properties especially as relates to blood sugars. Anecdotally, I've read where people have tried Eikhorn wheat and found no big jump in blood sugars. My standard answer to any ketosis prone diabetic is to give up wheat. It really doesn't matter what their symtoms are. I say, "Give up wheat." and if they do they always feel better after a month. It makes me appear as if I know what I talking about.The truth of the matter is the giving up of wheat seems to always ease physical problems. Give it a try. What this has to do with traditional foods is the fact that, due to global trade, a cheaply produced product is easily substituted for a more traditional product that tends to be more expensive. The more plentiful that cheap product is; the more likely it will be used as a substitute. Dwarf Wheat became the dominant variety starting in the late 70's. Unless that traditional food is tightly regulated such as Fasso wheat in Italy, it is more than likely Dwarf Wheat. More Dwarf Wheat If you look at our chart, it was just in time for our diabetes epidemic. On to seed oils. These have been around since the start of agriculture but except for a few cases like olive oil they could not be produced in great quantity until we had the industrial techniques to do so. These are what we call vegetable oils. So what are these graphs about? This is about fats particularly polyunsaturated fats. These typically come from seeds that are processed to get the oil out of them. The fats obtained from seeds tends to be mostly Omega -6's. The body uses Omega-6's and Omega-3's as building blocks. The problem is that the body doesn't distinguish between the two. This really wasn't necessary because in nature they would generally be found in roughly a 1 to 1 ratio. Thanks to modern technology, this has changed. The consumption of seed oils has continues to climb so much so that the ratio is now guessed to be between 10:1 to 25:1. Well what of it? As noted before, the body does not distinguish much between these two fatty acids. If the body is taking in 6's when it should be taking in 3's then the building blocks for a healthy body are wrong. It sets up a situation of chronic inflammation. This is from Wikipedia. Some medical research suggests that excessive levels of certain n−6 fatty acids, relative to certain n−3 (Omega-3) fatty acids, may increase the probability of a number of diseases. Modern Western diets typically have ratios of n−6 to n−3 in excess of 10 to 1, some as high as 30 to 1. The optimal ratio is thought to be 4 to 1 or lower. Excess n−6 fats interfere with the health benefits of n−3 fats, in part because they compete for the same rate-limiting enzymes. A high proportion of n−6 to n−3 fat in the diet shifts the physiological state in the tissues toward the pathogenesis of many diseases: prothrombotic, proinflammatory and proconstrictive. Chronic excessive production of n−6 eicosanoids is associated with heart attacks, thrombotic stroke, arrhythmia, arthritis, osteoporosis, inflammation, mood disorders, obesity, and cancer. 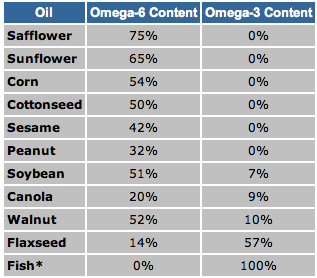 Here's a listing of the Omega 6 amounts in some of the most used seed oils. Most of these oils are not bought by people for consumption. They, for the most part, are used in the preparation of foods because they are cheap. Just imagine if your traditional food now made with flour from Dwarf Wheat is cooked in Soy oil. I was going to throw sugar in this overlong post but if you don't know about that then nothing I'm going to say here is going to change things. I will say this that once again cost is driving cheap substitutes like high fructose corn syrup into more and more foods. Look back up at the graphs. Look at the times. Does it seem as if we are doing something in our diets that have led to our present problems? Now back to the problems of people of color and this quiet but possibly toxic mix that has invaded their foods. If we once again look at a graph of the A1c's of KPD's we see a long running period of elevated A1c's. damage our bodies. I'm thinking that these elevated numbers are due to a low level hyperglycemia that is a reaction to chronic infection. In this case, I once again bring up the hypothalamus which is an active part of this system and is susceptible to malfunction due to high blood sugar. Remember, we are already prone to problems with dealing with carbohydrates, if you throw some fructose in there and cause the liver problems then you can be well on your way to DKA even with a traditional diet. We are looking at economics possibly overwhelming good sense. Cheap food additives produced thousands of miles away are quietly replacing the traditional healthy foods. I would say simply eat whole foods but under what conditions was this food raised?You should be reading labels on anything that is manufactured but do you know what you're seeing. Did you know that the "emulsifiers" you now see on labels is more than likely a transfat? Once again I make my usual plea. Get a meter and test the foods that you and your family eats. This is an addendum to this post. I started thinking that the key to much of what I have said is food production and the trade in food products. A little research found me this graph. Once again I ask you to look back at the graph of the growth of diabetes. 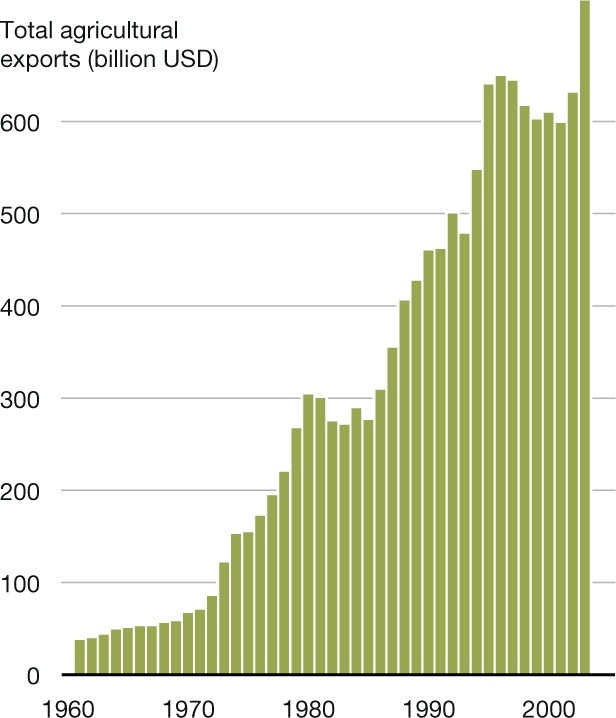 The growth of trade takes off at about 1986. Ten years later in about 1996 diabetes takes off as well and both increase rapidly from there to the present. I don't see this being explained by ideas of food palatability though there is certainly some of that there, nor do I see genetics or behavior explaining this either. Food has not got that much better tasting. Certainly genetics hasn't changed that much and I doubt we have become less industrious in the entire world in the last forty years. This last graph suggests to me that we have done something in the production of our foods that is metabolically traumatic. I well know that correlation is not causation but there seems to be something here and all I can do is nibble around the edges. This calls for a better mind than mine or more specifically some one like a Ned Kock who could possibly tease out what might be going on here. One could say that this is simply the usual "diseases of civilization" but one has to answer the question "Why does this occur now?". I'm at Michigan State University, where some of the best agricultural scientists in the world do their work and though I'm not at liberty to divulge any specifics, world food production is about to seriously take off in the next 10 years. The tests that I have seen suggests we could see a doubling to quadrupling of food production. In other words, an end to famine. More food is good but what if the food isn't? 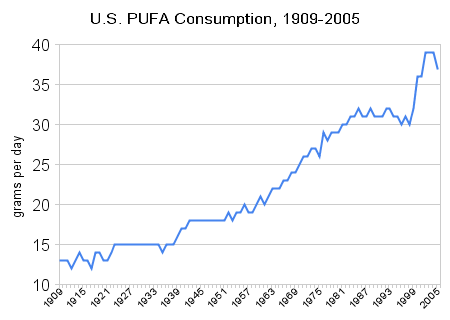 I love the graph on oilseed consumption! We've known since the 1930s that fatty diets cause type 2 diabetes! I don't believe that fatty diets, per se, cause diabetes. I think high omega-6 diets may be a problem which happens to be the case with most seed oils.